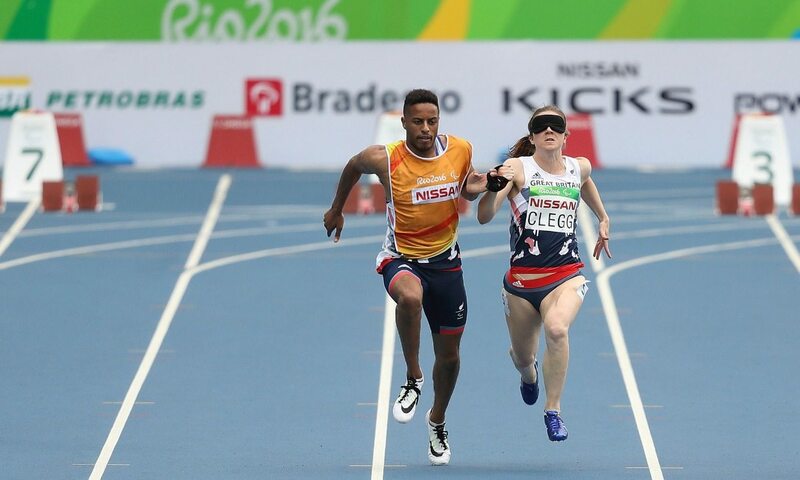 Libby Clegg and Samantha Kinghorn both safely progressed through the first rounds of their respective events on the first morning of Rio Paralympics athletics action. Clocking 12.17, Clegg was joint winner with China’s Zhou Guohua in their T11 100m heat and both will now contest tomorrow’s semi-finals where they will be joined by world record-holder Terezinha Guilhermina and China’s four-time 2015 world gold medallist Cuiqing Liu, who was just 0.02 off the world record with 12.03 to win her heat. “I’m really happy with my start to the Games,” said Clegg, who was reclassified from a T12 to a T11 sprinter only earlier this year. “I know I can go quicker, but I think just going through all the call room procedures and getting my bearings, it was a good first run. “There’s definitely more in the tank, so I’m looking forward to showing that tomorrow,” added Clegg, who races with guide runner Chris Clarke. Speaking with AW ahead of the Games, Clarke explained how both 100m and 200m gold medals should definitely be the aim for Clegg in Rio. There were also fast races in the T53 100m heats as China’s five-time Paralympic gold medallist Huang Lisha broke her own world record with 16.19 to Kinghorn’s 17.01 to qualify both athletes for this evening’s final. A Paralympic record was broken in the T12 100m heats as Cuba’s Omara Durand ran 11.58 to win the first race. The first athletics gold was claimed by Kenya’s Samwel Kimani as he clocked a 15:16.11 PB to beat home favourite and seven-time world gold medallist Odair Santos with 15:17.55. Brazil did get gold on the first morning of competition, however, as saving his best leap until last, Ricardo Costa de Oliveira soared out to 6.52m to claim the T11 long jump title, beating USA’s Lex Gillette with 6.44m. The men’s F32 shot put title was claimed by Greece’s Athanasios Konstantinidis after a world record-breaking throw of 10.39m, while F12 shot put gold was won by Spain’s Kim Lopez Gonzalez with a 16.44m PB. Latvia’s world record-holder Aigars Apinis won the F52 discus with a throw of 20.83m.